One of the problems in teaching software diagnostics and postmortem debugging is a simulation of complex software problem scenarios. There are plenty of real life memory dumps available but due to security considerations they cannot be shared outside of the organisation. Here we introduce Artificial Debugger project (ArtDbg) that simulates the I/O of the real debugger, for example, WinDbg, GDB, or LLDB. The real memory dump is analyzed in the real debugger, and all debugger input and output is saved in a log file. This log file is then scanned for any potentially sensitive information, and all such information is eliminated (Security Problem, Memory Dump Analysis Anthology, Volume 1, page 224). It is then converted into a binary pseudo-memory dump format. 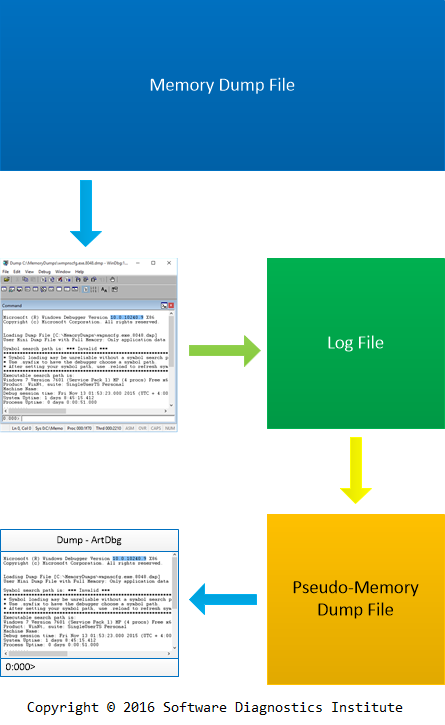 ArtDbg is used to open and analyze such pseudo-memory dumps. It allows using the same real debugger commands that were used to generate the log file. Such commands will output the same information that was available from the real debugger. Some real debugger commands that were not used to generate the log file may also be used if possible. Software Diagnostics Services plans to use the first version of ArtDbg in their new version of Accelerated Windows Memory Dump Analysis training scheduled in March 2016 to teach some very complex enterprise diagnostic scenarios in addition to WinDbg exercises with real memory dumps.